• Money off purchases from Boat Equipment (10% off all shop purchases. Does not apply to projects, engines or labour). 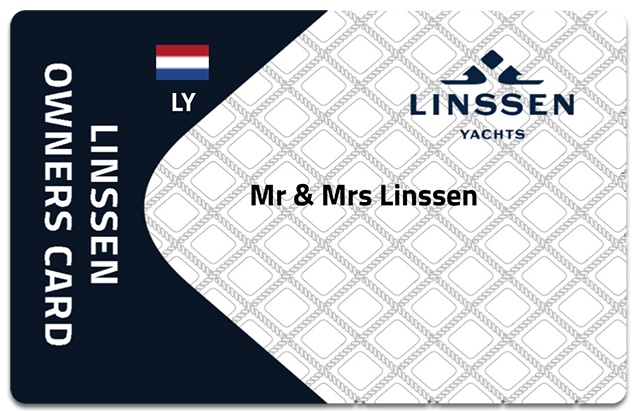 * The Linssen Owners Card provides you with rapid access to our stands at all boat shows. It is not an admission ticket to the show complex itself. Linssen Yachts Owners Card holders will receive a 10% discount on the first bottle of wine chosen from the a la carte wine chart. This offer is only for the extensive selection of 800 wines from the a la carte wine chart and not valid on glasses/bottles of house wine and/or wines for special arrangements. Free cup of coffee when you order a sandwich. 10% off all purchases. Does not apply to projects, engines or labour. These are subject to specific offers. At Restaurant Oud Oteren in Neeroeteren (Belgium), you will receive a free glass of Cava when you have dinner or lunch.